Fishing Report - Francois Lake Area - Welcome to NIHO Land & Cattle Company Ltd.
With over 3000 miles of shoreline and hundreds of productive lakes and rivers, the Lakes District is a paradise for fishermen of all skill levels. You can cast for trout along the shoreline, head into open waters for the elusive lake char, or test your rod against the feisty steelhead in the local rivers. To adequately describe fishing in this area would take an entire website rather than one article. 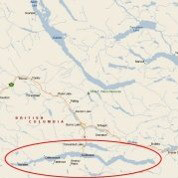 Therefore, NIHO will focus on two of the major lakes near Burns Lake: Tchesinkut and Francois Lake. We spoke with experts in the area to let you know where to head first for some of the best fishing in British Columbia. An old stomping ground of NIHO’s resident fishermen (and current NIHO property), Tchesinkut Lake is located 16 km south of Burns Lake. This lake is a great place to fish for rainbow trout and lake char. Rainbow trout can weigh up to 15 lbs, and char up to 30 lbs. Kokanee can also be found at Tchesinkut Lake. Many people overlook Tchesinkut on their way to the larger lakes further south, leaving the trophy fish to those willing to take the lake less fished. Beaver Point Resort notes that fishing last summer, both from boats and from the docks, was excellent, especially for trout and kokanee. All lake trout is catch and release only, except during February and July (when special quotas take effect). Francois Lake is the second-largest natural lake in British Columbia. We have asked several area experts for their thoughts on fishing in this pristine lake. The people at Birch Bay Resort are enthusiastic about the northeastern side of Francois Lake, where the resort is situated. They noted that “you can get dinner anytime you want” by catching it in their section of Francois Lake. When we asked them to review the fishing results from last year, they reported that the largest char caught by one of their guests was just over 29 lbs, and the largest trout was just over three pounds. They also said that whitefish and ling cod fishing in the area was excellent, both in winter and summer. Kokanee and Dolly Varden can also be found on this side of the lake, although Dolly Varden is rarely caught. They noted that while you can fly fish from shore, Francois Lake is really a boat lake. If you are going to stick to the shoreline, they suggested finding a spot with a creek running into the lake and fishing the points in that area for trout. Linking Francois and Fraser Lakes is the world-famous Stellako River, home to the Stellako River Lodge. Fishermen from all over the world come here to catch and release the feisty rainbow trout. Reports from last summer suggest rainbows over 5 pounds can be caught in this 10 km river. The Stelako very rarely turns muddy, making it an excellent fly fishing river. Staff tell us that fishermen either cast from shore or use pontoon boats to go deeper into the river. The Stellako is a classified river with a limited fishing season (June 1-Nov 14), and a special license is required to fish here. Check for current regulations and restrictions before heading out. On the west side of the lake, Susan at Noralee Resort said that last summer, no one went away without a rainbow trout. The average lake char was about 10-11 lbs, with the largest fish coming in the high 20 lbs range. The average rainbow trout is about 2 lbs, with rainbow over 2 lbs being common. As for the best spots, Susan noted that there are 2 or 3 different spots in the west end of the lake that are great for rainbow and lake trout. She suggests that you “look for the boats." Ling Cod is also plentiful here, and, again, can be caught in both winter and summer. Dolly Varden can be caught on this side of the lake, but is more elusive than the rainbow trout or the lake char. This is only the beginning of the fishing opportunities waiting for you in the Lakes District. Whether you are a skilled angler or just beginning to set your pole in the water, you won’t leave this area empty-handed. Come to the Lakes District, where the fish are biting on a daily basis.